The Viennese school and the second Viennese school celebrated orchestral lushness with a lighthearted approach reminiscent of their rich and airy pastries. And there the resemblance ends. Franz Schubert and Alban Berg, the beginning and end of this 100-year trajectory, are explored in four programs by the San Francisco Symphony led by Michael Tilson Thomas, their “Dawn to Twilight” festival. Schubert took the power and Romanticism of his hero, Beethoven (he was one of his pallbearers, and is himself buried beside him), and added rich, drifting harmonies that opened the door to Wagner. Berg followed his mentor, Arnold Schoenberg, into keyless wilds, but flavored his Modernism with Romanticism. In the May 29 concert, the shorter “Friday 6.5” program, MTT described early threads of Modernism in Schubert’s Unfinished Symphony, with examples from the orchestra. Tackling the first 30 bars, he illuminated the impulses of a genius. Basses floated in b minor, a mysterious ground with soft gravitas. Then the violins entered, a minimalist phrase which cello pizzicati thickened into urgency. And finally the well-known theme—woodwinds singing above the strings with a four-measure phrase, which they repeated, adding a fifth measure to reprise the melody. That last bar is self-referential, Schubert speaking directly to the audience and breaking the wall between composition and creativity. He directs us to his inner process, and it is a moment of true genius. It is a work so full of thoughtful touches that MTT wondered how it could ever have been written. The proud chords and force majeur of Beethoven coupled with the fragile lyricism of Mendelssohn, and with swooping dynamics that nonetheless sound natural. Many composers have tried to complete the two movement work with a final synthesis, but Schubert himself set it aside, and it remained “unfinished” at his death at 31. Berg’s Seven Early Pieces preceded, sung by mezzo-soprano Michelle De Young, an international opera singer and veteran of the Metropolitan Opera. One could hear the influence of Debussy on the young Berg—his whole tone scales and sense of mystery, but tempered by De Young’s silken vowels and long-held burnished notes. The rich tannins of her voice suited the German love poetry, and Berg’s experimental writing did nothing to detract from the emotions of the text. 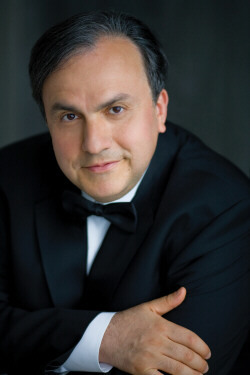 The Symphony engaged three high-powered soloists for their second program, heard Thursday, June 4: violinist Julia Fischer, soprano Laura Aiken, and pianist Yefim Bronfman, any one of whom could have commanded a solo engagement. Schubert’s Rondo in A Major for Violin and Strings was fiendishly difficult but essentially decorative, a perfectly charming exhibition number, and Fischer was sweet-toned and fluid in the non-stop runs. Berg came into his own in this concert, with Piano Sonata, Opus 1, in a stunning performance by Bronfman. He sat down and launched immediately into the work, implying that the audience was almost incidental. Through a living presence in the music one could believe that Bronfman was also incidental: there were no fiery displays, pregnant pauses, idiosyncratic timing of the runs. In other words, there was no ego. The playing was superbly mature and gifted us with Berg’s complex vision. Despite Berg’s penchant for breaking rules, one can hear the inner consistency and soundness of design. Cascades of notes shimmer with the weight of water, then crash and ebb. Water transmutes to breath, elusive, alive, curiously biological. Aiken topped off the concert with Berg’s Altenberg Lieder and suite from Lulu, and Schubert’s Der Hirt auf dem Felsen, his last composition. Her agile voice was equally at home in the romantic lieder and in Berg’s “bad boy” song cycle, which the orchestra embellished with slides and bowing under the bridge. Aiken growled at the bottom of her range, sipped at stratospheric highs and stage-whispered, more than equal to Berg’s demands, and at times was simply luminous. The Festival culminates with Schubert’s epic Mass No. 6 with the SF Symphony Chorus and Berg’s Violin Concerto, featuring Gil Shaham, Thursday, June 11, at 2:00 p.m. and Friday and Saturday, June 12 and 13, at 8:00 p.m. Information is available at www.sfsymphony.org or at 415-864-6000. Photo, top: Julia Fischer; bottom: Yefim Bronfman by Dario Acosta.